Red Dot INSIDE SRI LANKA A monthly insider’s report by Royston Ellis, December 2015. Even though it’s hot and sunny in Sri Lanka at Christmas, unlike in Europe, the season is properly commemorated. Midnight mass is celebrated in the country’s churches (some seven per cent of the population is Christian) and, Christmas day being a public holiday, people of all faiths enjoy camaraderie, on the beach or in their homes. In the run up to Christmas, Colombo follows Christian capitals with carols being played ceaseless in the city’s stores, and shop windows decorated with cotton wool snow and faux fir trees hung with pretend presents. It’s the time when visitors find it hard to resist shopping for souvenirs to take home. Tea and gems would seem to be the most popular take away gifts. But what if you don’t like tea, and gems are beyond your budget? Luckily Colombo has several shops specialising in unusual souvenirs at reasonable prices. Some cater specifically for those seeking traditional wares while others are more upmarket with bright displays of trendy items. 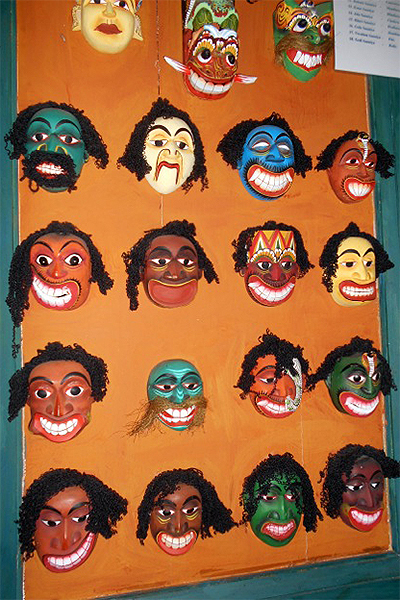 In addition to the government sponsored souvenir shops with displays of authentic items made by village craftsmen, there are several upmarket boutique shops with various locally made products such as handloom fabrics or wooden door wedges painted like Sri Lankan characters. Not all the souvenirs on sale in those trendsetting shops are actually made in Sri Lanka. Some items come from Thailand, Indonesia, the Philippines and, of course, China. Shopping for souvenirs during a visit to Sri Lanka is not a modern pastime. A writer on the island’s handicrafts in 1905 commented: “Gold, silver and brass boxes and trays were extensively made, those in silver and brass now forming the staple of the passenger trade.” Brass items including trays and bells are still manufactured today. If you are staying in a beach hotel, take a tuk-tuk (three-wheeler taxi) to the nearest town and look in local shops for souvenirs. Avoid the tacky souvenir shops where things likes masks and leather satchels will be overpriced (and include a commission for the lad who walks in after you and says you’re his client). Instead, look in hardware shops where townsfolk buy their kitchen equipment to find such curiosities as a wooden pestle and mortar, a chilli grinding slab and rolling stone, even a patchwork mat or a coconut shell spoon. The price you’ll pay will be what a Sri Lankan pays. Sri Lankan supermarkets are a fascinating source of locally manufactured food items, especially if you want to cook at home. Buy packeted spices in a supermarket (as the Sri Lankan housewife does) instead of purchasing from tourist-oriented spice gardens. You’ll also find packeted curry powders, which will help you create the authentic taste of a Sri Lankan rice and curry dinner at home. The upmarket souvenir shops in Colombo and Galle Fort, and in some hotels, have souvenirs of good craftsmanship and good taste. Some of the shops are so packed with colourful raiment, knickknacks, candles and cute items, it’s easy to spend a morning browsing through everything. They are like modern antique shops where everything is contemporary but so well-designed the items would thrill any cultured recipient, or look good at home. 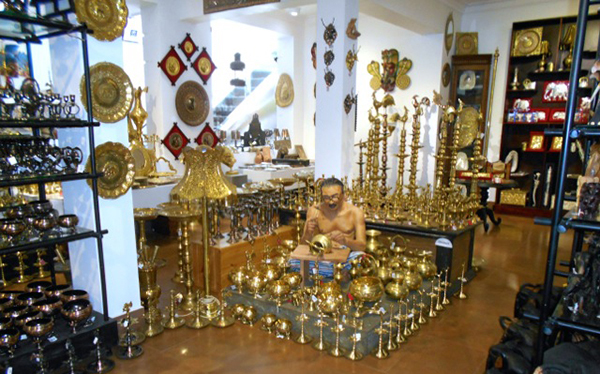 All kinds of craft are practised in Sri Lanka, from brass and leatherware to handloom weaving and batik designing. Batik making has progressed from the clumsy artwork of the past to some sophisticated designs and dyes to complement contemporary fashions. Batik designs also make attractive wall hangings. The brilliant colours that distinguish locally hand woven fabrics are much in demand for sarongs (worn here) or ponchos (make you own to wear at home). Village cooperatives and youth self-employment enterprises manufacture items like handmade soap scented with natural ingredients such as sandalwood, cinnamon, coconut, eucalyptus, aloe and peppermint. The same skill, dedication and scent goes into the making of candles, Particularly attractive are floating candles in flower shapes in yellow and white, modelled on frangipani blossom and lotus shapes. They can be lit to float in a bowl of water, even as a table decoration. Similar cooperative ventures also produce soft toys. Locally made cuddly geckoes, monkeys and elephants make a tropical alternative to (or companion for) a child’s teddy bear. A more elaborately made elephant can be chosen from ones carved from wood and decorated with chips of mirrors and coloured glass representing the lavishness of the caparisoned elephants that take part in parades. An unusual souvenir is paper manufactured locally from elephant dung. No, it doesn’t smell but is very fibrous and useful to use as a talking-point place card for a dinner table. Fantastic takeaway souvenirs of Sri Lanka are easy to find in the main souvenir shops at worthwhile prices, or from beach and wayside vendors who’ll merrily haggle as you try to bargain with them. If you see something you really want, it’s fun to buy…because it’s Christmas. Red Dot INSIDE SRI LANKA A monthly insider’s report by Royston Ellis, November 2015.